Thanks to Messy Mommy (which could very well be my alias too) for this fabulous award. Copy the award and paste it to your blog. Tell us 7 interesting facts about yourself. 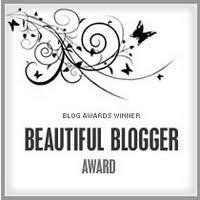 Nominate 7 bloggers that you love, and link to their blogs. 1. My favorite t-shirt to wear around the house (turn-around, grocery store, etc) is one that my BFF made for Retro to wear to the Halloween party at Disney. It says GRUMPY. 2. I really like to do puzzles (not too hard) & Retro, Bo & I finished putting together one last night. Yes, Retro helped! 3. I pay extra (& do without stuff they don't carry) to shop at our local grocery store because the workers know me & my kids, it really doesn't matter if we look or act like white trash, the bag boys know my car & how to open/close the back. 4. I was very crafty before children. 5. My first car was a burnt orange 1973 Datsun 210. I wrecked it about 6 months after I turned 16. Broke my collarbone. Raise your hand if you remember this!!! 6. I have a tattoo of the Christian fish on top of my foot, just under my toes. 7. I did fertility treatments with Sass & Bo. And had an ectopic pregnancy between them. Baby Girl was a surprise. Okay, so I'm not that interesting. But that's all I got! 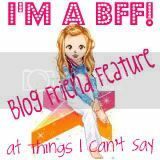 And since I love all my blogger friends, I'm giving the 1st 7 commenters this award. In fact, everyone who comments gets this award!!! And y'all spread the love! I'm totally with you on #3. It's worth it! Great to find out things about you! You are very interesting, my dear! And one of my very favorite people evah!!! o.k....so I raised my hand and remember the car wreck where you flipped the datsun, and ran into your mom in the driveway, and hit Becky in the rear end, and OMG...I know there's more...why can't I remember them all? I didn't know you did fertility treatments!! It seems like almost everyone I know who's gone through treatments has ended up with a surprise pregnancy at some point!